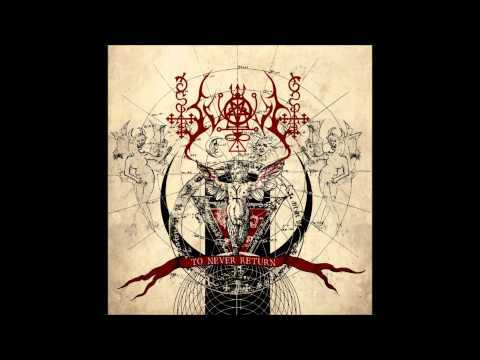 My first impression of Hungarian Svoid, in both visual and audial essence, is that Watain must’ve served as a big influence. And with their recent release of the “The Devil’s Blood” (Watain cover) I think it’s safe to say that that is the case. But I would not stretch it as far as calling the band a clone. “To Never Return” offers 9 tracks (plus two instrumentals) of quality black metal in the vein of bands such as Watain and alike, but unlike the forementioned band Svoid is more of a diamond in the rough. Whilst the band display a nice showcase of musicality there’s still some elements that aren’t necessarily executed with 100% accuracy. But instead of hurting the bands sound this is in fact something that just enhances the overall feeling throughout the whole album. A big plus for the bass guitar that is quite high in the mix, but as a bassplayer myself I think it’s safe to say that it is something that I noticed especially. As mentioned in the beginning of the review, the visual aspect of the “To Never Return” album is really something that could compete with any other bigger black metal release of today (artwork courtesy of Péter Sallai) even though it’s an independent self-financed release. As for the sound picture it is somewhat rough, but very suiting for this type of black metal that is more about atmosphere and spellbinding melodies than sheer speed. In conclusion, “To Never Return” is a recommended buy for everyone into the more cryptic and occult form of black metal. And if my review isn’t enough to persuade you, just take a listen to the opening track below and be convinced.